James Kennedy » Odd-Fish Art: Prequel Edition! First things first: I judged an Order of Odd-Fish contest at Margo Gremmler’s blog. Contestants had to create their own “Unlikely Musical Instrument” in the Oddfishian style. Competition was fierce, and there were many great entries, but I have spoken. Thanks, all contestants! Karen takes this little phrase and goes to town! This is one of the things I enjoy most about fan art—how some artists take something that’s offhandedly mentioned, just a line or two, and expand it. And what a humdinger of a picture! I particularly appreciate how the women are all obviously totally smitten by the monsters, and the monsters are laughing flirtatiously. And the variety of fashions, and the variety of monsters, are wondrous! I want to go to this party. Seeing these puts me in the mood of writing the Odd-Fish prequel! Karen writes that this is Sir Nils “right before he enters the service of the Silent Sisters. I kind of wanted to show him contemplating betraying his fiancee and Order (as well as his city and all of humanity but that’s another story.) ” Karen got the brooding, “contemplating betrayal” emotion spot on. The shifty expression and sidelong grimace seal the deal. An tense, threatening portrait! For Korsakov, Karen writes, “this is a young(er) Korsakov, probably when he was first assigned to capture the Schwenk. I imagine he looks a bit spacey because his digestion is telling him two things at once.” Spacey, yes; and fierce; and, somehow, rather bohemian? I guess it’s because Karen gave him longer hair—it gives him a raffish, artistic vibe that offsets nicely his military background. Korsakov let himself go a little when he settled into Eldritch City. Great job on all of these, Karen! I appreciate how you made the charcoal drawings serious and foreboding. It restores to the characters their proper dramatic weight, a heft that can get lost in all the wackiness of the book. 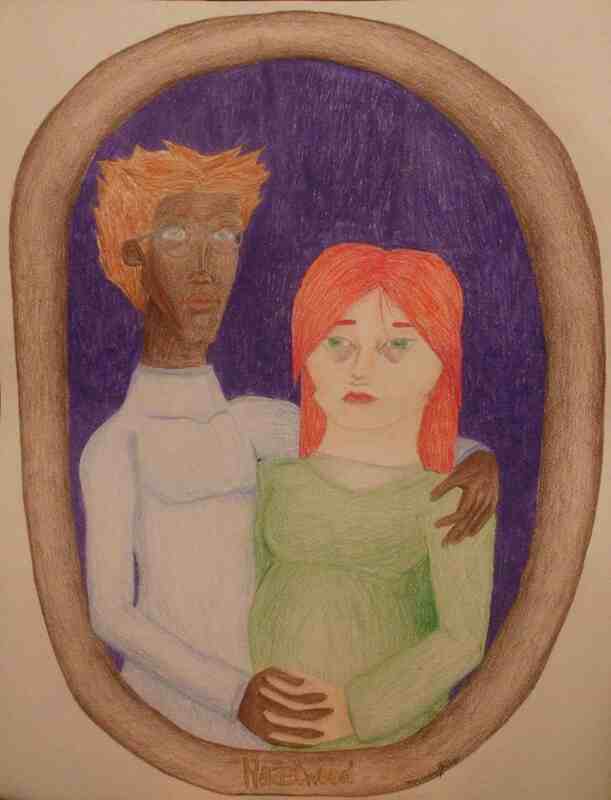 And finally, by Mercedes (offbyzero on DeviantArt) two more characters from before Odd-Fish begins—Sir Martin and Dame Evelyn Hazelwood, the parents of our heroine Jo. A family portrait taken just before Jo’s birth! I especially like Dame Evelyn’s haunted look, with the darkness under her dead-to-the-world eyes, and Martin’s muddled, slightly-worried-but-I’m-not-quite-sure-what-for air. Mercedes deftly captures the awkwardness of the young couple as Dame Evelyn’s nightmarish secret festers between them. Another inspiration for a prequel! The events leading up to Jo’s birth, and the still-unrevealed surprises around it, are all worked out in my head. I just need time to sit down and write the story. Thank you, Karen and Mercedes, for yet more outstanding Odd-Fish art. With these pictures you haven’t just illustrated the story; you’ve expanded it, added to it, and enriched it.